You know when you wait too long to eat and you are no longer hungry but you know you have to eat? Yeah, sigh, that was me this evening. I went for a nice long walk (4.94 miles or 7.95 km) and when I got home I decided instead of showering, doing my hair, picking out a semi-decent outfit and running out to take care of a quick errand I’d just go in my workout clothes, that way I could keep my baseball cap on and since it had been raining while I’d been outside I just looked damp, not sweaty. Well, after the errand I got back to my place, showered, got in to comfy clothes, threw a load of clothes in the wash and realized I had missed my “hungry time” and was no longer wanting any food. I was super tired though, which I was attributing to the lack of food in my system. Crap. I hate eating when I don’t feel hungry, ugh. 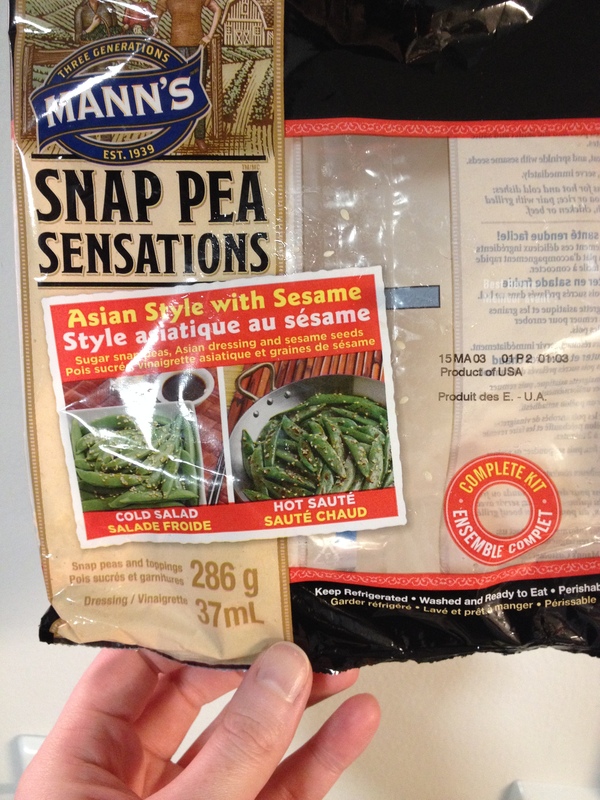 I found some snap peas in the grocery store the other day that are a “complete kit”, it is already washed snap peas with a little package of peanut sauce and a second little package of sesame seeds. According to the instructions on the bag you can either eat the snap peas hot or cold, well, duh lol. I opted to heat up the snap peas and use some of them as topping on the salad, the rest I put in the fridge and will eat tomorrow. Underneath the snap peas there was half an avocado (sliced), yellow pepper (diced), mixed raw veggies (corn, carrot and beans), pumpkin seeds, and mixed greens. 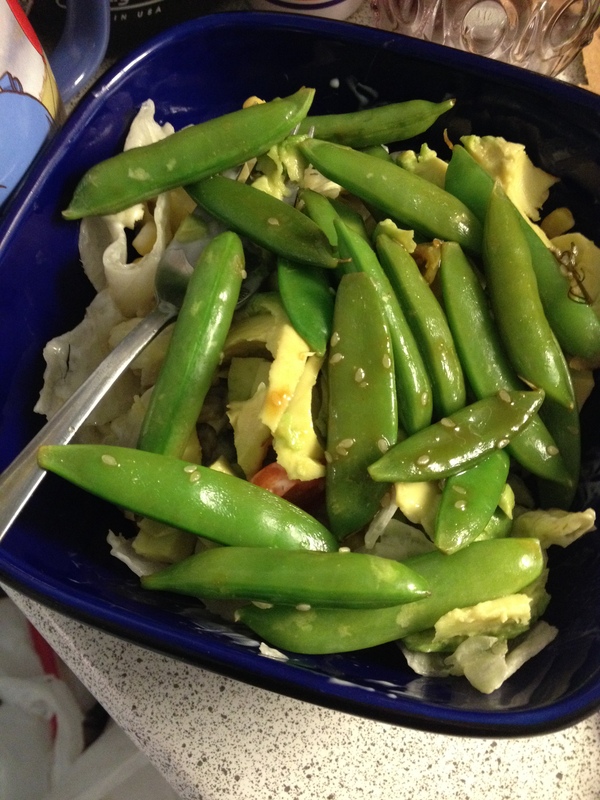 Everything except the snap peas and avocado had been mixed with a small amount of light ranch dressing. 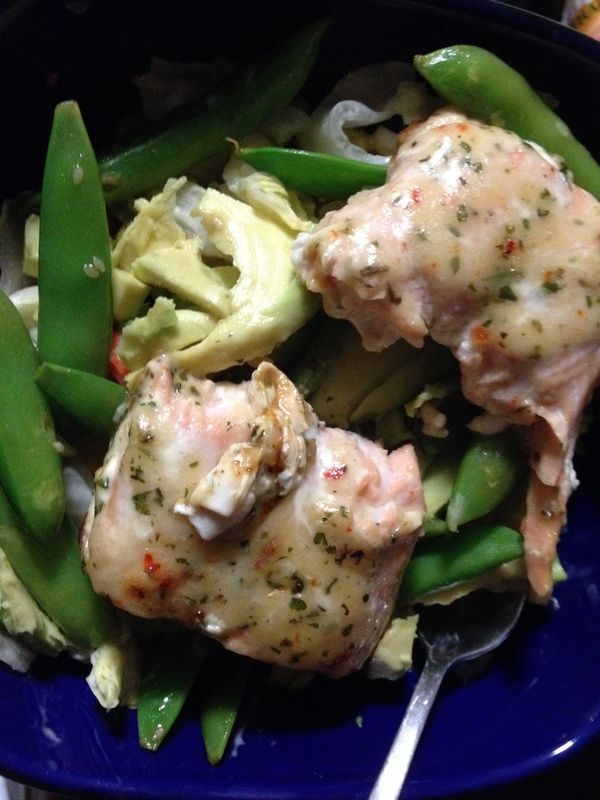 The snap peas had the peanut sauce and sesame seeds on them and then for the final touch I put the salmon on top.